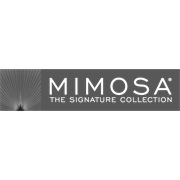 Enjoy delicious cocktails or a meal with friends on this Mimosa Silverleaves 7 piece bar setting. 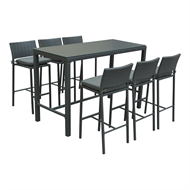 Featuring a generous sized table with tempered glass table top and 6 bar stools with back support for extra comfort. Finished in a handwoven resin wicker and powder coated steel frame, the setting will provide that resort style feel right in your own backyard. The aluminium covered foot rests will ensure these stools last for many seasons to come.